When I went to the San Francisco History Days event at the Old SF Mint Building on 5th & Mission this morning, I didn't for a second think I'd be asking a most delightful 83-year-old woman at the Visitacion Valley information booth, Cris, if she knew my Uncle Buddy had been gay. 'Oh, we ALL knew he was gay!' She then went on to say that at that time they didn't use the word 'gay'. Cris told me, too, that she'd been a late-bloomer. -that she'd always had her head in books. She thinks that is probably why Buddy asked her out. She was a safe bet. Cris told me that William had killed himself by hanging & wasn't that awful? I told her that, actually, William had fallen into the San Francisco Bay and drowned. He had likely been drunk at the time. -least that's what I had always heard growing up. I called my mom later to relay the meeting with Cris. When we got to the part about the hanging, she said: No, it wasn't Buddy's father, but rather the neighbor across the street that had hung himself. It's interesting what folk remember & how they remember. Grisly stories like a neighborhood suicide tend to stick in some way, I guess. Until today, I didn't know that the San Francisco Public Library had an arm dedicated to the preservation of SF history. I dropped by their booth at SF History Days to peruse their wares. They had a smattering of SF high school year books (none that my family, to my knowledge, were in) from various different decades. 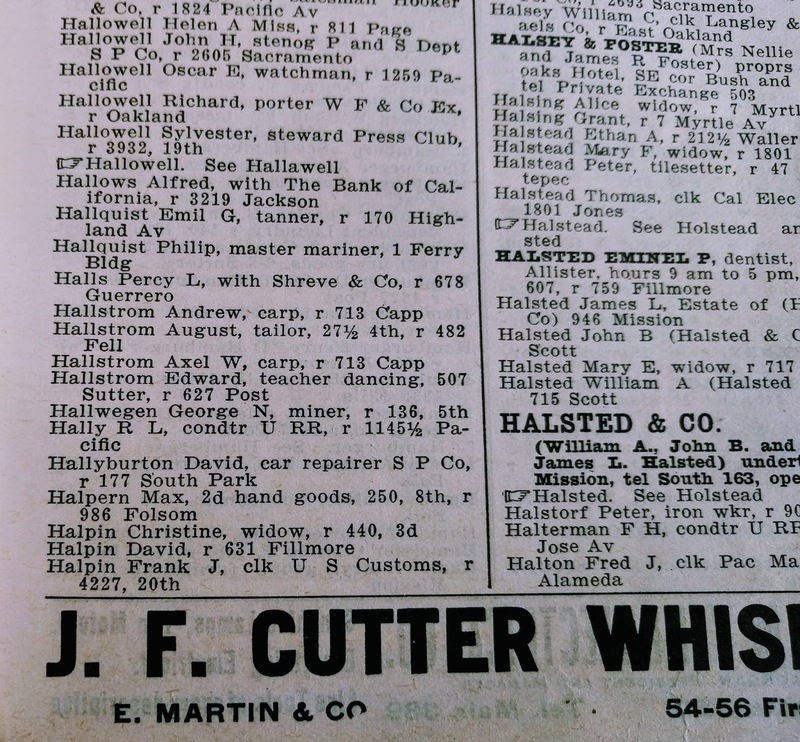 More interesting though, were the three SF directories (the Yellow Pages of their time) on hand. One was from the late 19th century; two were from the years before and after the earthquake of 1906. At that time, two of four sets of great-grandparents were living here. I figured I'd look them up. 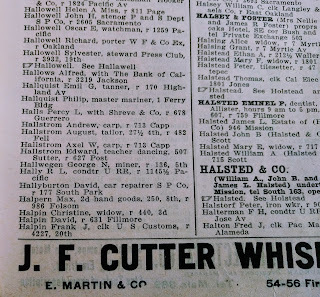 I found great-grandpa Axel in both the '05 & '07 directories. That was a fun discovery. Prior to his living on Andover St., I hadn't realized Axel had been elsewhere in Bernal Heights & also down in the Mission. You don't know what you can no longer ask of anyone. My 80-year-old Uncle is sort of the last in line. Fortunately, he's keen to chat on all things family history. A phone call to him is in order. San Francisco Directory, 1905. Sweden represent! The Bernal Heights History booth was staffed by wonderfully enthusiastic Bernal lovers. I spoke with one woman who is a passionate researcher of Bernal lore. I left her my email address, so that she may mail me any information she might find regarding the Hallstroms, my paternal grandmother's Swedish immigrant parents. I took her card in order to send her turn-of-the-last-century photos depicting the house on Andover St. & snaps of the family. 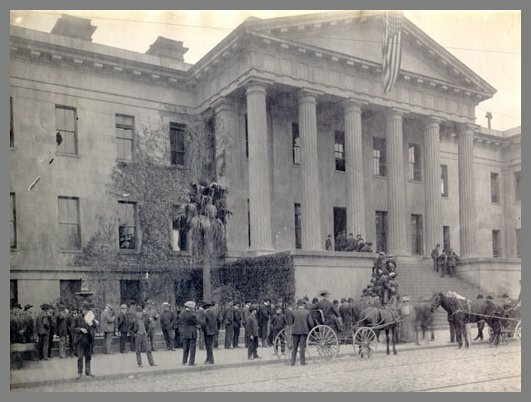 When the Old SF Mint was new. The three and a half hours spent at the Mint really flew by & I'm so glad I went. My family history is shrouded in mystery. My father made an oyster look garrulous, and my mother's relationship with the truth was flexible. Wow, really cool. I'm curious as to how you got to talking about your uncle with Cris, though. I approached the booth & asked the ladies if they'd all grown up in Vis Valley. They said that they had. More questions followed. Cris is just about the same age as my Aunt & Uncle. She knew them both. It's a small neighborhood & all the (not very many) kids knew each other. It was such a treat to chat with her.